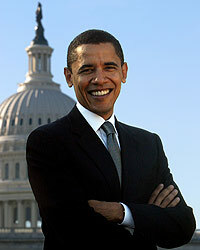 AMERICA NEEDS BARACK OBAMA IN 2008!!! Why Barack? | About us | Barack bio | Volunteer | What Others Say | Is he Ready? "...For those of us who believe that government has a role to play in promoting opportunity and prosperity for all Americans, a polarized electorate isn't good enough. Eking out a bare Democratic majority isn't good enough. What's needed is a broad majority of Americans  Democrats, Republicans and independents of goodwill  who are reengaged in the project of national renewal, and who see their own self-interest as inextricably linked to the interests of others." We are Democrats but we believe Barack's appeal is across the spectrum. He can bring this country together and end the destructive partisanship. Do you think Barack should run in 2008? Please click Yes or No, then click Submit. What attracts you to Barack? Please enter your opinion, then click Submit. as phone banking and door to door canvassing for support of Obama. We suggest you invite like-minded family/friends to our website.